Two crashes in less than half a lap! 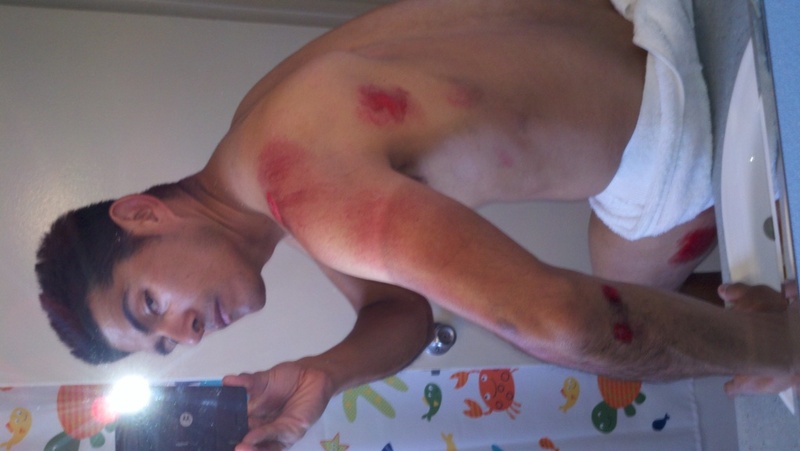 That was my fate in the 2012 Dana Point Grand Prix 35+ race on Sunday, 06 May 2012. 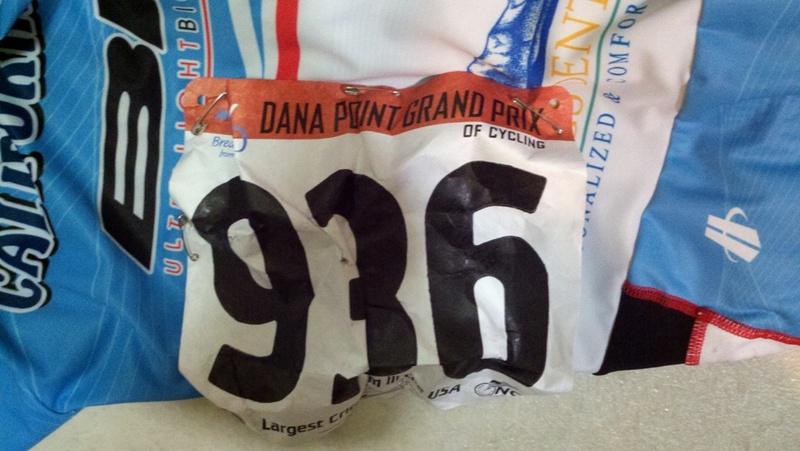 After bursting on the scene 5 years ago (2007), the Dana Point Grand Prix has grown to become one of the premier criteriums in the nation. They say, "the best race course in America" and it's backed up by the fact that USA Cycling advised the event attracted the most licensed racers for a single day criterium event in 2011. Besides the great location and weather, the National Criterium Calendar race features a $15,000 Pro race prize list to attract the national pro teams; the other races are well funded, full, and hotly contested. Everyone wants to put on a show and win. As a racer, the prize list and location certainly make it attractive, and so does the fact it's not a boring four corner industrial crit. It's a course with six turns and some elevation changes, meaning positioning and skill come into play more than just the usual power. The 35+ field was stacked. 35+ racing is a bunch of 35 and older guys, but these are 35 and older guys that motor! Many are ex-pros, should still be pros, could still be pros, and some are practically pros. The point is, 35+ racing is often just as fast and competitive as some of the Pro races and this was one of them. Teams with numbers included Monster Media p/b MRI, Surf City Cyclery, Team Helen's, Breakaway from Cancer, and my team, CA Pools / CFS Mortgage. The race started normal and quickly got up to speed. 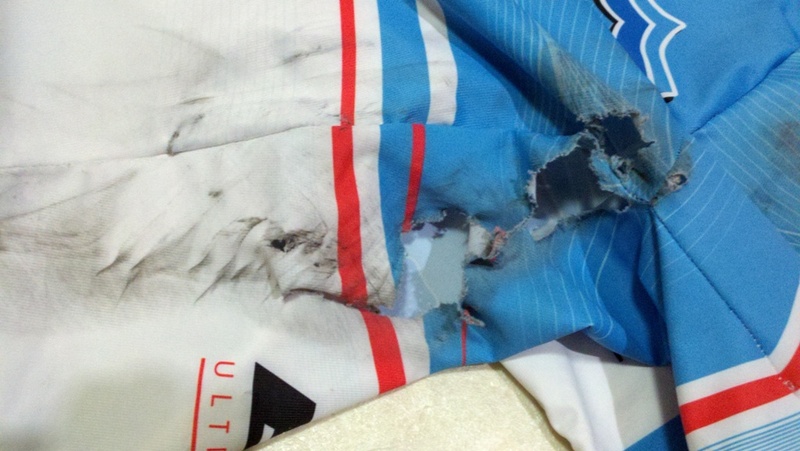 My role for the team in the race was to cover attacks and help our primary riders in them or get to them. I started at the back but quickly made my way to the top 20 in order to avoid the tiring rubberband effect further back and to be able to best respond to the action. I was comfortably finding my way around turns and through the pack. I felt on. Around 15 minutes in, a well-represented six man break started to get up the road and without anyone from my team. A few riders responded, trying to get across, and I used them up before launching my own effort to get across. I made it and latched on between turns 3 (a right turn) and turn 4 (a left turn). I felt good getting across and was ready to start thinking about how I'd approach the break. I rode up into the slipstream and then to the right of the wheel of the last rider (Team Helen's), then just at that moment, the person swings out to the right and hits my front wheel. I was hit hard enough that I couldn't keep control and went down to my right. Now, I've been doing this long enough to say two things. 1) It was partially my fault for overlapping the wheel to the right. 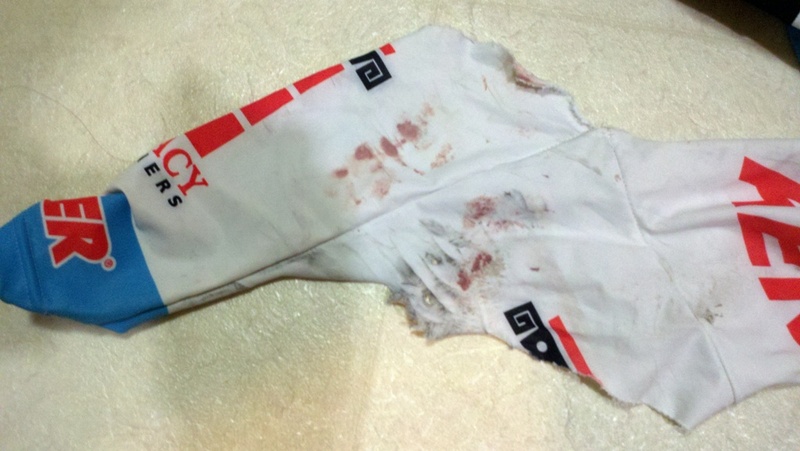 2) The majority reason for the crash was the Helen's rider's unsafe position change. My take on it is he thought he was alone back there and decided to use the room he thought he had to swing and set up for the left turn. Except he wasn't alone and I hit the pavement as a result. The seconds between getting hit and going down and getting back up are few and often sharp and blurry all at once. 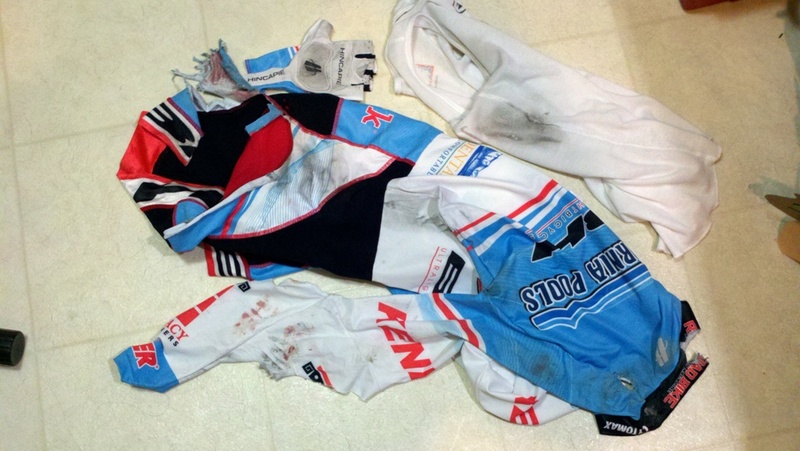 When I got hit, I thought I was going to keep it up and quickly figured out I was going down. Since I'm an experienced crasher, once eating asphalt was clear I limbered up, put my head and shoulder down, and took it on the right. I don't recall tumbling, but I do recall bouncing back up, grabbing my bike, and shouting something (probably profanity) as the rest of the field caught and then passed me, thankfully without further incident. Bouncing right up was a good sign, because it meant nothing of my body was critically damaged or broken (or felt wrong at that moment) and I wanted back in. 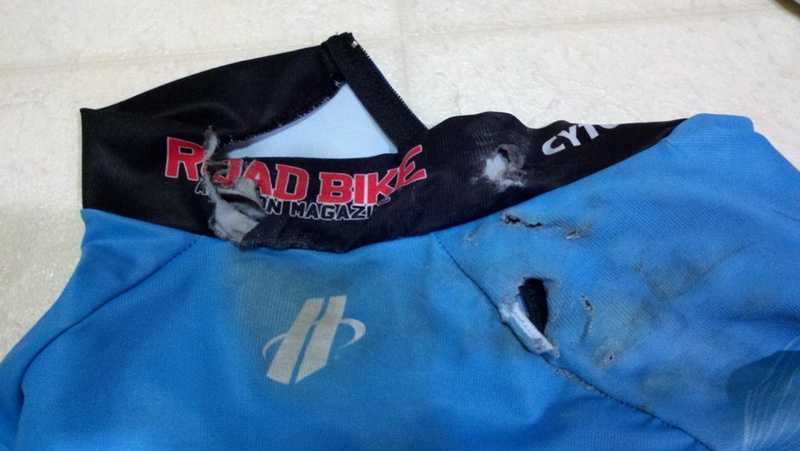 My bike was in good enough shape to ride, so I got the chain back on and cut the middle of the course to the pit. 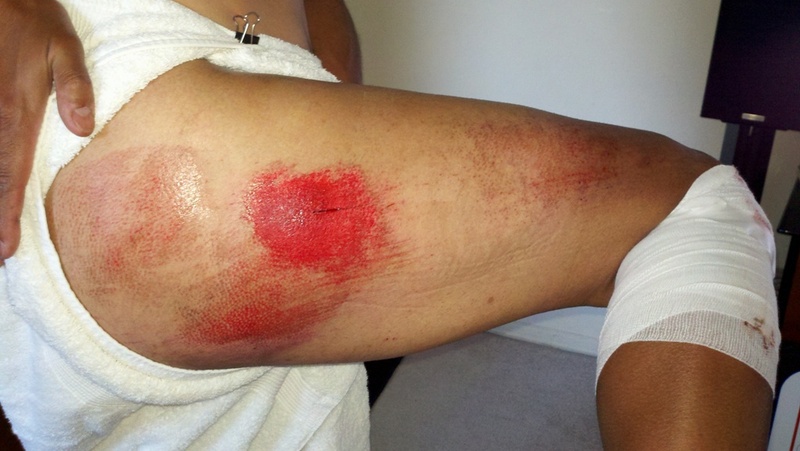 I knew there was road rash but didn't take an assessment. I wanted to be sure I was back to the pit and my bike checked out with enough time for me to get back into the race and go. 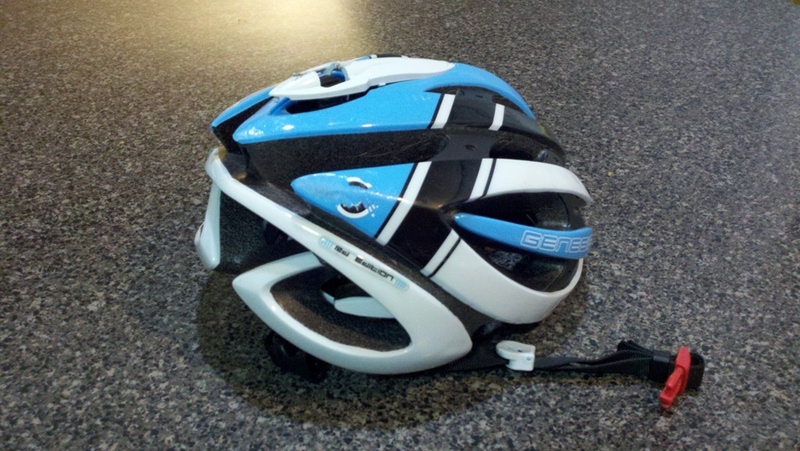 The Shimano guys checked out and straightened out the bike and I shared a few jokes with referee John Allen. I mounted up and waited for the field to come around. The field started to come by and I was given the okay and a push. Because of the field's speed, I had to put a lot of effort to get in towards the back, but I was in into turn 1. The stretch to turn 2 is a long one, so I decided to pick up the speed and make my way back up to the front as fast as possible. There I was, minding my own business, when into turn 2, BAM! - I'm sliding out of the corner. The slide was long and I knew damage was being done to my body. Thanksfully I didn't take anyone else down with me. I couldn't understand what had just happened but I was able to pick myself up off the ground again, grab my bike, and head to the curb to figure it all out. 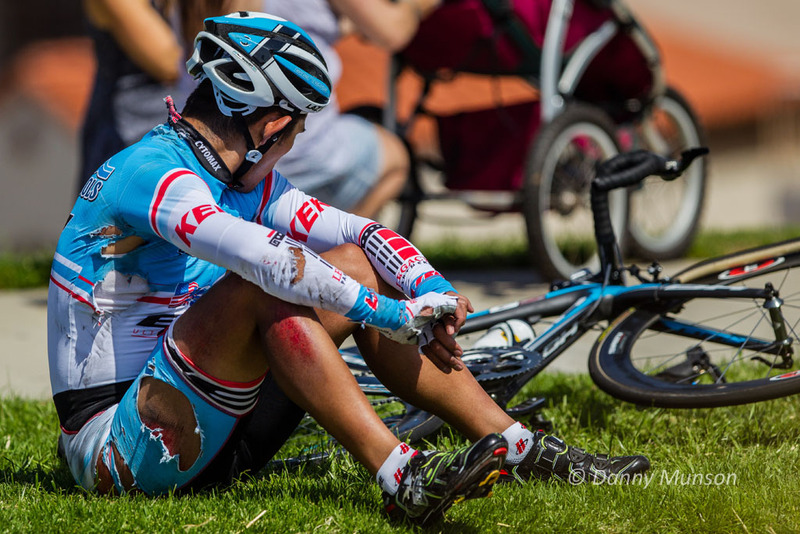 The photo by Dan Munson (DMunsonPhoto.com) tells an excellent (albeit painful) story. There I am, sitting on the grass, torn and tattered, lamenting my two crashes and my lost opportunity to help the team do well in this race. And there in the photo, too, is the evidence of what went wrong. A rolled tubular tire on the front. 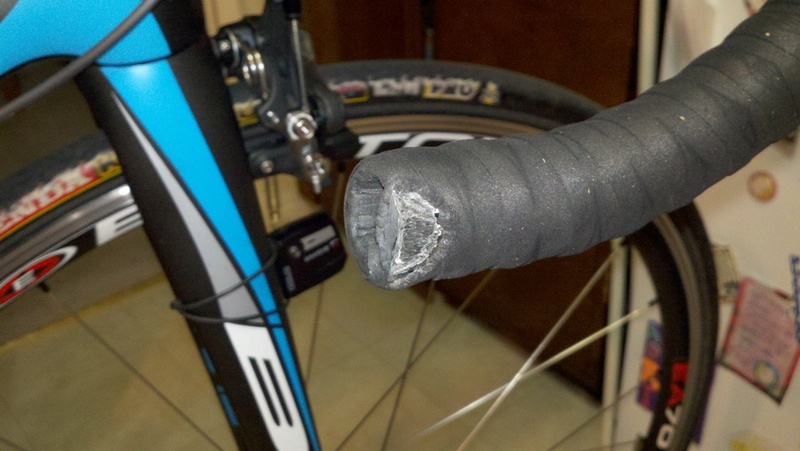 It seems I must've rolled a tubular crashing the first time. It wasn't obvious to me or the pit guys; it must have reset onto the rim, but separated so that the glue was no longer keeping it on. As soon as I hit turn 2 with enough speed, the tire gave off the rim and down I went. End of story. Case closed. I was thinking I might still get patched up and get into the Pro/1 race later in the day, so I carried my bike on my shoulder back to the pit and asked the Shimano guys to see if they could get me going again. I was a "look at that!" spectacle as I made my way there. My parents were there to watch the race. My dad helped me hobble to race medical where they took care of my body, scraping out most of the gravel and bandaging me up as the race continue to roll by. 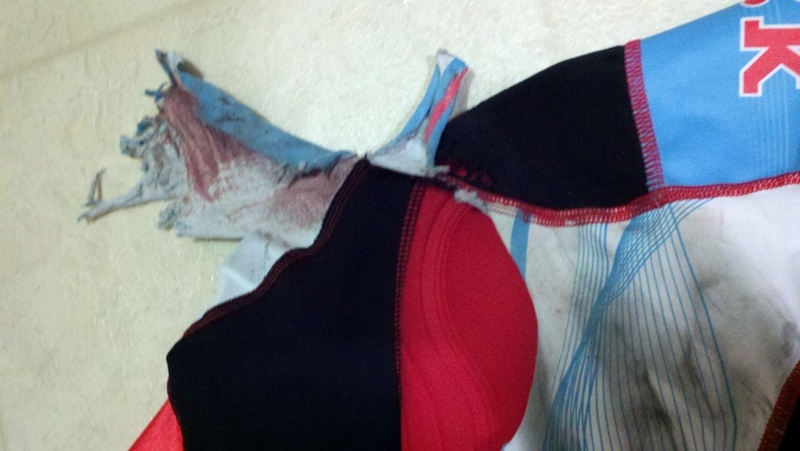 It was painful and I was teary-eyed during the process, but never broke out into a full wail. Thanks to those guys for putting up with me, and thanks to mom and dad for always giving care, concern, and support. Realizing the extent of my physical damage and with the pain starting to grow, I decided not to do the Pro/1. Registration was kind enough to refund my entry fee for that race. At the pit, the Shimano guys had straightened everything out and had me ready to roll on a pair of loaner wheels. 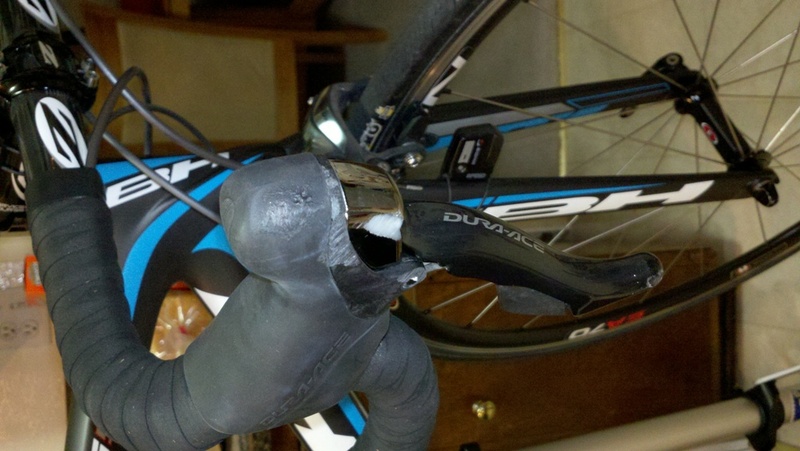 The good news was nothing was damaged so much that it couldn't be ridden again. I thought about it one more time, and fully decided not to mount up again that day. I wasn't feeling too bad when I got home because I unbandaged and posed for the camera as my wife catalogued the latest race souvenirs (see photos at right). Part of it was delaying the invitable and painful shower and clean up that needed to be done next. 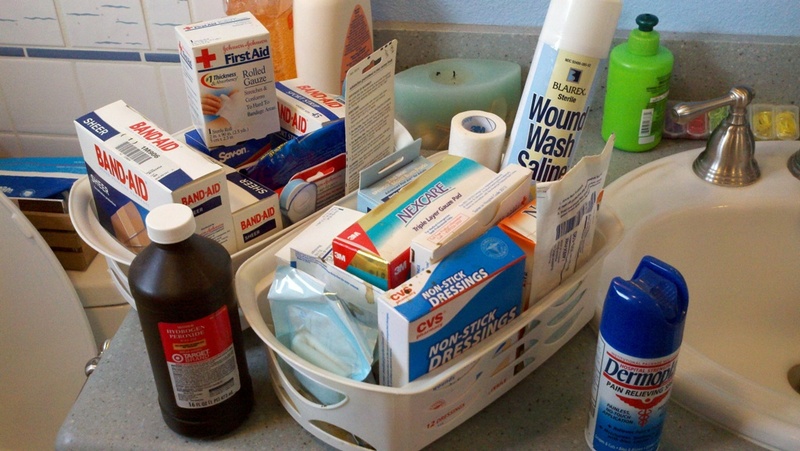 As an experienced crasher, I have two baskets of bandages and wound care supplies at the ready. I pulled them out from under the sink and got to work. 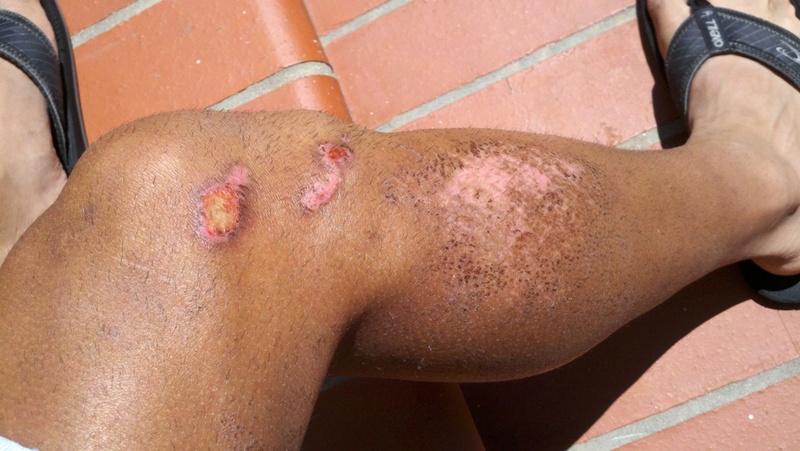 Water on roash rash stings badly. Wash closh scrubbing out gravel from road rash hurts like a mofo! 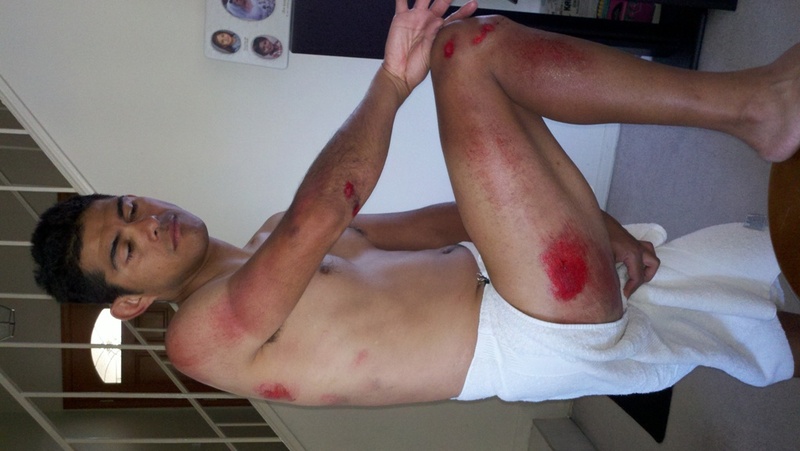 Interesting fact: When you have road rash, it hurts in those places when you get goose bumps. Don't get goosebumps! Here's what this crash cost in terms of what got damaged, broken, etc. You can see photos of the damage below. 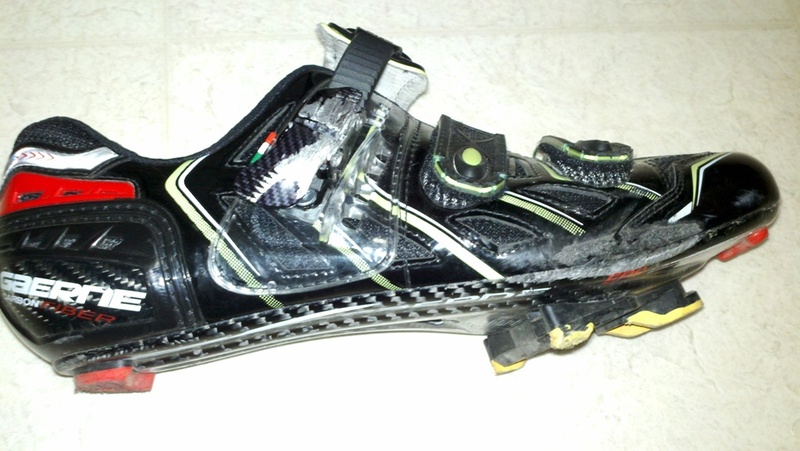 Gaerne Carbon G.Air Black shoe - scuffed - $? 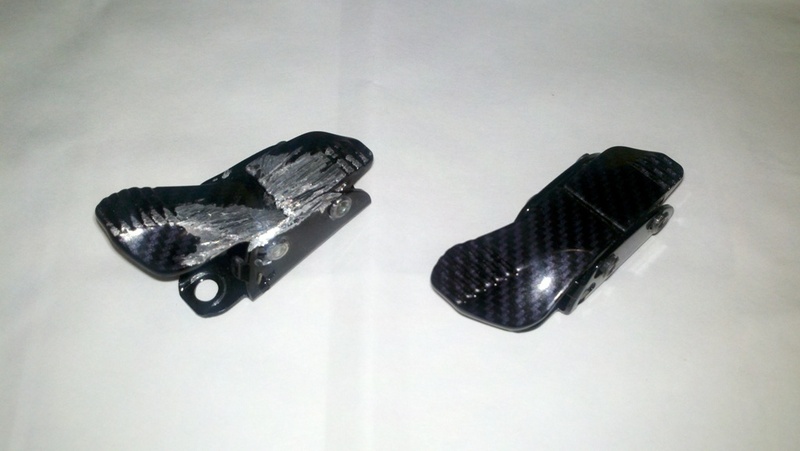 Shimano Dura-Ace 7900 Brakes/Shifters (aka Brifters) - scratched - $? 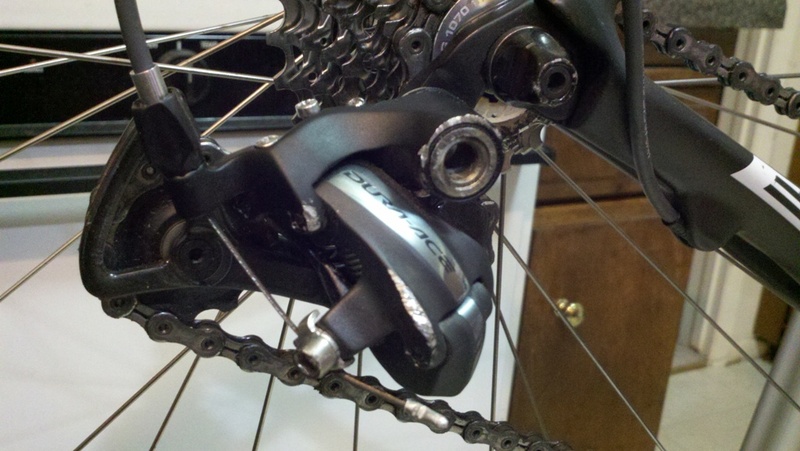 Shimano Dura-Ace 7900 Rear Derailleur - scratched - $? 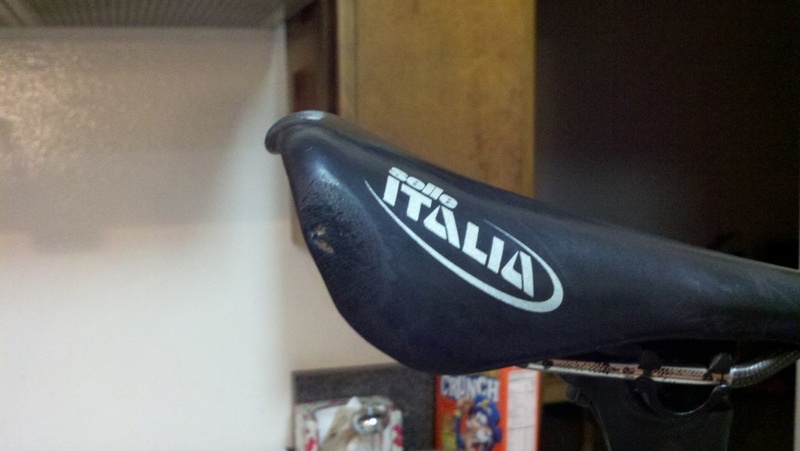 Selle Italia Flite - Team Black - scratched - $? ZIPP SL V2 handlebars - shaved - $?